Free Shipping on ALL Delta products. Popular Delta Allora Collection Kitchen faucets are available in many finishes. 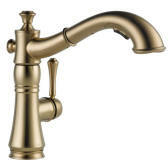 Best selling Delta kitchen faucets, Allora, Classic, Graves, LeLand, Orleans, Saxony, Signature, Sincerity, Talbott, Vessona, Victorian & Waterflow collections. Call us for all Delta products, including Delta Brizo faucets, for the best prices. All Styles, all Finishes generally in stock! Free Shipping & Best Prices on the Internet!